The material on this site is variable; for some, a tribute to a cat might seem to be out of place but Buster deserved a chance in life. Perhaps, I grant him a somewhat greater measure by sharing his story. There are navigation aids in the MasterBorder to the left and at the end of each page. The cluster to the left provides access to chapters in a progressive order. The title of each chapter as it is brought into view will also be highlighted in the cluster. The bar labeled “Directory” will allow the reader to access other Sections on this site, but perhaps the reader will find some satisfaction in “Buster’s” story? The “Section Diagram” in the cluster to the left and at the end of the page is an attempt to facilitate the reader’s movements about all of the Sections. All the Sections have at least 2 tiers, most have three tiers. At the end of each page, there is a cluster providing movements among the individual pages of this, and all the other, Sections (NEXT, BACK, UP, DOWN). The reader, having become acquainted with the structure of a diagram of a model section will have a better understanding of the utility of the navigation aid. This Section has 3 tiers. The “Site Diagram” is independent of the UP and DOWN aids; it is accessible as the first item in the cluster to the left. The “Introduction” is alone on tier 1. The next 6 Chapters occupy tier 2. One Section (“Directory” ) occupies tier 3. If at tier 1, a click on “Down” (underlined aids are active) will take the reader to the first chapter of tier 3 (“The Old Man”). If at tier 2, a click on “Down” will take the reader to the first Chapter (“”The Old Man”). If at the first Chapter of tier 2 (“The Old Man”), the reader will be facing the options of either “Next” or “Back.” If he then selects “Back,” he will be presented with the last chapter of tier 2 (“The Old Man 2”). 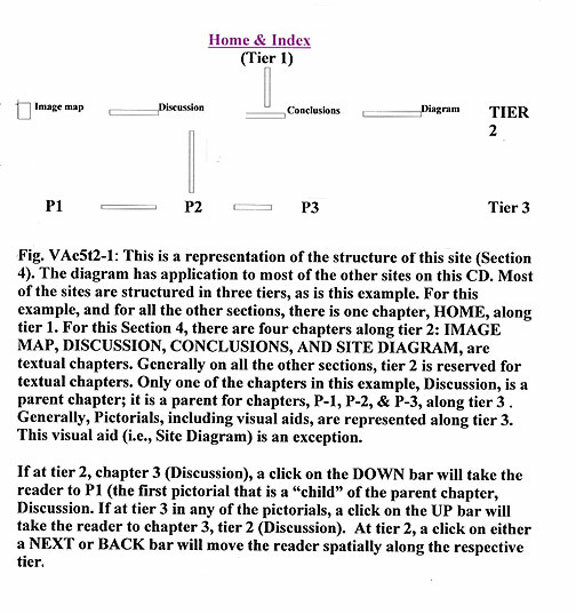 Using “Down,” “Directory” will be accessible only if the reader in at the last Chapter (“The Old Man”) on tier 2; “The Old Man” is the parent Chapter of “Directory” on tier 3. Similarly, if at the “Directory,” the only option will be “Up;” such a click will take the reader to the parent (“The Old Man 2”). The underlined items will show which options are available to the reader. Additional comments about migrations are available in Chapter 9 (Directory), the only chapter at tier 3. Cats are common enough, many are household pets. As pets, they mostly seem to be sought after by women. It would be a mistake to equate the likes of a fluffy indoor cat with those of an abandoned counterpart. Too many cats come to be abandoned and homeless; they roam neighborhoods in search of food, shelter, and, most of all a quality that is hard to come by - human kindness. Feral cats search out isolated locations in which to hide during the day, or in which to sleep at night, after completing their nightly rounds. Many of the household cats are not pets for life; they are more in the nature of toys with which children are entertained until a time when interest in the cat is lost. Then, even if they are still fertile, they are likely to be turned out to join, and add to, the other feral cats on the street. In an urban setting, a feral cat is at the mercy of a variety of predators, including dogs and even other feral cats. Feral cats of a pride make distinctions among the candidates seeking both asylum in the pride, and a share in a common supply of food. Some of these candidates will be accepted into what will become a larger pride; others, for reasons that are unclear to most humans, are ostracized and chased away, or attacked. Success in attempts to limit access to available food often is an expression of strength in numbers. Dogs pose a threat to the life and limb of feral cats. Most of the fatal attacks on feral cats are perpetrated by dogs that are not restrained on a leash. In one option, an owner refuses to use a leash while walking a dog; in another, pets are let out to wander throughout the neighborhood, with the expectation that they know the way home; or, thirdly, dogs are abandoned to become strays. Strays often run in packs, with coordination among the members of the pack. They become adept in cornering, and killing, cats. Feral cats mostly are treated as pests; they are undesirables in most neighborhoods. Dog owners often view them with disdain; seeing them as little more than prey as they walk their dogs, they encourage the dog to chase away any stray cats. It is especially disturbing to observe a mature man, a man who, above all, should have acquired an appreciation for the transiency of the life of small animals, display a penchant for allowing a dog to pursue a feral cat. Old humans, as a group, tend to have a meaningful appreciation for the trials of life; for the commonness of these trials; and for their effects. Across the spectrum, of not only human populations but also the animal world in general, the old, as a group, are appreciative of the special privileges which God affords the young. Special privileges become the lot of those feral cats that come to be welcomed by sympathetic humans. The compatibility that can develop between a cat and a human is on display in those nursing homes in which cats live among humans. The cat in this tale is a most handsome animal who, if the opportunities for domestication had been accessible early on, would have become a most desirable companion for any human, but especially for an old man at loose ends. To lead the reader through the events, an intermediary will be required; our “old man” will serve the purpose. Two stages in the adult life of our old man can be defined; the breakpoint occurs following a life-changing tragedy. During the second period, any failure, any unforeseen tribulations, usually have evoked from him the entreaty: “Oh God,” or “Oh God, Jay” (Jay being the name of his deceased son), as if, following such an imploration to God, his frailties would be forgiven, his burdens lightened. Having endured a troubled life, our old man, at the time of our story, found himself to be susceptible to the charm and allure, and the vulnerability, of most of the youthful animals in God’s kingdom. He encountered an innocent, young and handsome cat. In our story, such a cat and our old man found each other. The old man, on seeing, with delight and appreciation, the developing traits of the maturing, young animal chose for him the name, Buster (most assuredly, he was a buster). I am a cat; at least humans refer to me, and my kind, as such. In some settings, cats have a role in the control of pests, particularly rodents. In urban life, cats, in one way or another, are mostly dependent on humans. We show appreciation for attention from humans by rubbing against their legs; in this practice, we also mark the humans who are kind to us. If we encounter loving humans early enough in our development, we become more trusting; we come to accept their caresses. Unfortunately, many humans, by some perversion of their understanding of the nature of little, smart animals, have an aversion to cats; they aggressively do all they can to eliminate them from their immediate surroundings. I had associations with two groups of humans; the first eventually put me out of his house and life. The members of the second group, a husband and wife, tried hard to make me a part of their life; often trying to coax me into their home. Being inexperienced in the handling of cats, they proved to be unable to provide what, for a cat, might might be an inducement to abandon a life in the out of doors. My name is Buster (aka, Buster Brown, or Buster-wuster); my favorite human, an old man, named me. Some cats come to develop a correspondence with receptive humans; once established, they then can accept, and adapt to, a confinement in the home of the respective human. If this accommodation is not accomplished early on, then it is most difficult for most of us to give up the independence of an outdoor existence. My protector (his interpretation of his role) came, too late, to a decision to domesticate me. I was willing to accept neither their affection, nor an offer of the comfort and security of an indoor existence, if, in turn, I would be required to sacrifice my freedom. I must admit that I was on my way to dependency during my first encounter with a human. Early on, I was an indoor cat for a short time; for some reason, there came a time when my first “protector” put me permanently outside and just moved away. When I first encountered this second human group, I was inexperienced and not fully grown. I tried very hard to communicate to them my desire to get back indoors. While they procrastinated, I practiced the role of an outdoor cat, but was always careful to assume a submissive posture, if I began to experience hostility from whatever cat that I, in this period of training, had selected as a potential adversary. Early on, I learned to run after any cat, once it became clear to me that the cat had begun to walk away from my domain; almost all cats, if surprised and approached in such a manner, will begin to run away. If, during this maneuver, the cat surprised me by turning to confront me in anger, I would assume a submissive posture by lying flat, and then remaining still on the ground. This maneuver worked well for me during training. I became a part of a “pride.” If a group of lions constitutes a pride, then surely a group of feral cats deserves to be similarly identified. My interactions with the other feral cats required decisions as to who would be acceptable as members in our pride; certain cats were acceptable, while others were to be excluded – the desideratum, as the members of the pride saw it, was to preserve an adequate food supply. As I matured, I found myself in a leadership role. I became the “point man” for a security patrol at the boundaries of my “protector’s” property. Other cats, not of the pride, were denied access to the scattered food supplies; I had a major role in chasing them away. Birds and squirrels required close attention; they seemed to take the position that our food was to be accessible for all. Often, when being pestered by the old man for my attention, I quite simply would have to turn away, and pay attention to a crafty bird, or a larcenous squirrel. Unfortunately, a raccoon (a very peculiar animal, unafraid of cats) became a nightly visitor. I made a halfhearted attempt at a confrontation but was unsure of what would be needed from me, if the confrontation were to become too hotly contested. The old lady, having been bothered by the appearance of a raccoon at our feeding site, began to pick up the food at intervals during the evening. She also stopped leaving bowls of food about to be available for us all night. Our security duties ceased - and we were free to wander - once the humans picked up the food supplies. Cats are felines - a not altogether acceptable human characterization; not all of the traits, embraced in this characterization, flatter my masculinity. On the other hand, some of these characteristic traits (nimbleness, quickness, cunningness, and agility) proved to be useful in keeping the old man, and other humans, from being in control. If the old man attempted to feed an ostracized feral cat, one outside the range of our guard line, I would disturb the cat by progressive encroachment upon his area. Then, using threatening gestures, I would scare him away. The old man, being less than agile, could not run me away without also scaring away the feeding animal. Mostly, I tried to accommodated the old man. I found some comfort in the attentions that humans bestowed on me; those who pander to cats seem to have a need to lay their hands on us, but most old feral cats are not receptive (they have too often received ill-treatment at the hands of humans). I was receptive to, and even came to appreciate, the affection the old man bestowed on me – it seems that this trait is most developed in some, but not all, older humans. This appreciation was not of a degree that would have encouraged me to give up my freedom. The old man and I were at loggerheads on the issue of where I should sleep. I had searched out, and informed, my litter mate of my good fortune in having stumbled upon a pride of cats at the home of an understanding, somewhat senile, old couple. He and I did not share nightly lairs; I slept in a garage behind a home that was mostly vacant; he slept under a house several doors away from the location of the garage. We would meet at the old couple’s backyard for breakfast. Then, we would leave, only to return in the afternoon. I would always appear earlier in the afternoon than my litter mate. Once in the company of each other, we would play, practice fighting techniques, and sometimes just embrace each other. The old man seemed to enjoy watching us. Bars to right provide access to other Chapters of this Section. The Whithers can be found on: Virtual Images:Neoplasia as a garden is the theme. The bar to the left is fashioned as a “child” level item; if at tier 2, only Home and the children at level 2 will be available. If at tier 2, all the chapters of tier 2, and the single chapter of tier 3 will be available. The gray bars to the left provide access to other web sites. Black bars to the left, and above, provide access to other Sections on this site.